The plaque may be viewed in the main lobby of MIT Lincoln Laboratories, Lexington, Massachusetts. Engineers, mathematicians, scientists and technicians, from the Massachusetts Institute of Technology's Digital Computer Laboratory, the Air Force Cambridge Research Laboratory, and MIT's Lincoln Laboratory, played the key role in the development of the Semi-Automatic Ground Environment (SAGE) system, the first major real-time, computer-based command- and- control system. Designed as a new air defense system to protect the United States from long-range bombers and other weapons, the SAGE system sent information from geographically dispersed radars over telephone lines and gathered it at a central location for processing by a newly designed, large-scale digital computer. As the system evolved, SAGE broke new ground in radar, communications, computer, information display, and computer programming technologies. SAGE not only revolutionized military command-and-controls, but led to landmark advances in online systems and interactive computing, real-time computing, and data communications using modems. SYSTEM OVERVIEW - The SAGE system used ground-based radars, sea-based radars on ocean platforms called Texas Towers, and airborne radars to detect enemy aircrafts. Digital communication links conveyed this information to command centers, where the first large real-time digital processors - novelties at the time – tracked the radar targets and guided fighter-interceptors to engage the intruding aircraft. Although Lincoln Laboratory’s primary responsibilities was to invent the needed command-and-control processes by using the newly emerging technology of digital computers, many development in radar technology were also needed to provide the “clean” data demanded by the computer. AIR DEFENSE – THE FIRST YEARS (extracted from reference  pages 148 -151). “The first major Lincoln Laboratory effort in air defense, the Cape Cod System, was designed to integrate a surveillance net consisting of large search radars, height-finding radars, and gap-filler radars with a central digital computer (called Whirlwind) by using telephone lines for data transfer. The computer accepted target data from the radars and created tracks showing the positions and movements of the enemy aircraft. 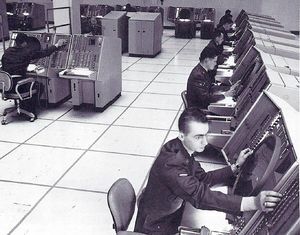 The computer then formulated a response and sent messages to the fighter aircraft so that they could intercept the target aircraft. “The first version of the Cape Cod System was fully operational in September 1953, and it demonstrated that air battles could be managed with such a system. The next step was the augmentation of the Cape Cod System to form the Experimental SAGE Subsector, which covered more of New England. The Experimental SAGE Subsector included more radars, better data processing at the radar sites, a more capable central computer (the AN/FSQ-7), and improved display and control consoles for the human operators who were an integral part of the SAGE system. An early warning radar searches for approaching aircraft. The radar detects an enemy bomber approaching North America. Telephone lines carry information from the radar to the SAGE Direction Center. The SAGE Direction Center processes the information. The Direction Center notifies interceptors of the target. The Direction Center notifies higher headquarters. The radar updates the position and course of the intruding aircraft. The Direction Center notifies the appropriate surface-to-air missile batteries. The Direction Center receives information from adjoining centers. The Direction Center vectors interceptors to target. The Direction Center receives status reports and other information. The Direction Center provides final guidance to interceptors. Interceptors destroy intruding enemy bombers. The Direction Center receives raid assessment from interceptors. The Direction Center apprises headquarters of status and results. SAGE System maintains alert for additional hostile aircraft. The work required research and innovations in many different fields: computer hardware and software, radar, and communications. Many organizations were involved, MIT, Lincoln Laboratory, the Cambridge Research Laboratory (AFCRL), and others. The contract for manufacturing the AN/FSQ-7 computers was awarded to IBM. Western Electric Company provided buildings and internal power supply and communications. Phone lines were provided by the Bell System. System Development Corporation (SDC) was responsible for the software which consisted of 500,000 lines of assembly language. SAGE uniqueness is evident by the many innovations attributed to SAGE as follows:  1- HARDWARE DESGN: Magnetic-core memory. Digital phone-line transmission. Digital track-while-scan. 2- SOFTWARE TECHNIQUES: Multiple simultaneous users. System data structures. Structured program modules. Global data definitions. Table-driven software. Software debugging tools. Data description language. 3- USER INTERFACES: Interactive graphic displays. Light-pen input. On-line common database. 4- HIGH-RELIABILITY OPERATIONS Marginal checking. Internal parity checking. Built-in test data reduction. ACCOLADES FROM VARIOUS WEBSITES: A- SAGE revolutionized air defense and also contributed significantly to advances in air traffic control systems. As the SAGE system matured, the Air Force pursued the development of a number of advanced command, control, and communications systems. B- In peacetime SAGE was, for all intents, an air traffic control system. It influenced the design of the FAA’s automated control systems. C- The system also gave IBM valuable insight, and it was not long after that the CEO of American Airlines met one of the IBM people involved in SAGE by accident on a flight, and soon the two companies were developing the SABRE airline reservation system. D- Other major SAGE developments which included the CRT based real-time user interface, and use of wide-area communications via modems. 1. William P Delaney and William W Ward, “Radar Development at Lincoln Laboratory: An Overview of the First Fifty Years”, Lincoln Laboratory Journal, vol 12, 2000. 2. Thomas P. Hughes, Rescuing Prometheus: Four Monumental Projects That Changed the Modern World (Pantheon Books, New York, 1998). Chapter 2, pp. 15-67. 3. EC Freeman, ed., MIT Lincoln Laboratory: Technology in the National Interest” (Lincoln Laboratory, Lexington MA.1995). Chapter 2, “The SAGE Air Defense System” pp 14-33. 4. Robert Buderi, The Invention that Changed the World: How a Small Group of Radar Pioneers Won the Second World War and Launched a Technical Revolution (Simon & Schuster, New York, 1996). 5. Kent C. Redmond and Thomas M. Smith, From Whirlwind to MITRE: The R&D Story of The SAGE Air Defense Computer (MIT Press Cambridge, 2000). Karl Wildes and Nilo Lindgren: A Century of Electrical Engineering and Computer Science at MIT, 1882-1982 and The Electron and the Bit: Electrical Engineering and Computer Science at the Massachusetts Institute of Technology, 1902-2002. Chapter 17, “From Whirlpool to SAGE”, pp. 280 -301. Robert R. Everett, ed. Special Issue: “SAGE (Semi-Automatic Ground Environment,” Annals of the History of Computing, 5:4, 1983. George E Valley, Jr., “How the SAGE Development Began,” Annals of the History of Computing, 7:3, 1985. Robert Wieser, "The Cape Cod System," IEEE Annals of the History of Computing, 5:4, 1983. John F. Jacobs, "The SAGE Air Defense System: A Personal History" (MITRE Corporation, 1986).